Improved tire life through new suspension geometry. 1-inch lower ride height without losing suspension travel; (Spindle provides a 1-inch drop with this conversion). Has additional caster built into the upper arms. Dedicated offset upper control arm shafts are used. Ball joint angles are corrected to accommodate new geometry. Round tube design provides superior strength. Load carrier upper ball joints offering increased strength over original stock 4 bolt. Allows 11 inch, 12 inch, 13 inch or CAT5 disc brake upgrades. Crossbars provide additional strength during braking and cornering loads. Positive bump stop eliminate possible over travel of ball joints. Stock spring may be used if desired. Control arm are shipped pre-assembled with DEL-A-LUM Bushings. What is required to convert to a Negative Roll system? In order for A-bodies to convert over to a Negative Roll system, four components are required. Tall GM spindles, special tubular upper control arms, machined lower ball joints, and different outer tie rods are required. Why? Because the donor cars spindle tapers are different. G-bodies only require tall GM spindles and special tubular upper control arms. Spindle tapers for this conversion are the same as the standard shorter spindle. See additional part requirements: If stock lower arms are used you will need machined lower ball joints part #2005 for installation. However, if you use lower control arm CNR-42L for standard springs or CNR-42H for coil-over applications, the correct ball joint for the spindle is used. 2. Outer tie rods part #3007 (1964-70 A-body) / Part #3008 (1971-72 A-body) sold in pairs. Did you know? Tubular lower control arms are available with the correct ball joints installed part #CNR-42L for standard spring and CNR-42H for coil-overs. Does my ride height change? Yes! Front ride height will drop 1 inch because of the taller spindle and lower ball joint combination. Why can’t I use my stock upper arm? The upper control arm is too long and alignment will be a problem. Why should I use your arms versus others? 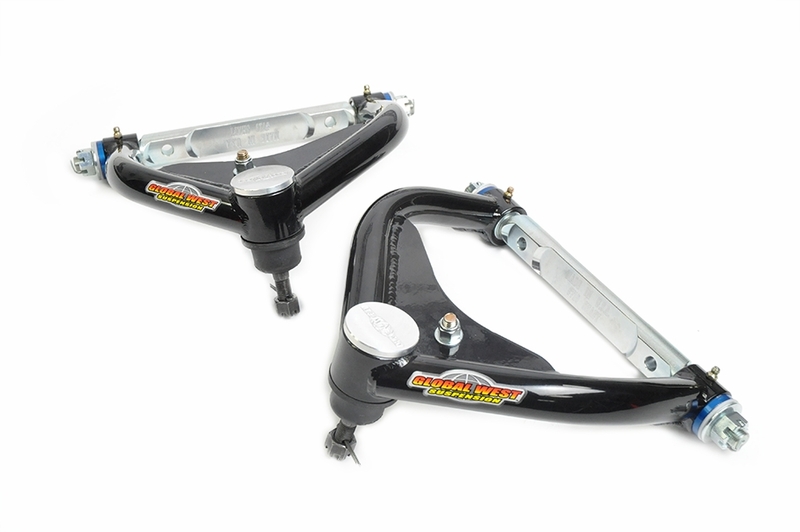 Global West control arms have better geometry curve, built in bump stops, load carrier ball joints, and special billet offset shafts. Del-A-Lum bushings are standard and we include a product warranty. Tech Tip: The maximum wheel backspace that can be used with our Negative Roll system on a 64-72 A-body is 5 7/8 high back space on 17 inch wheel, 5 inch back space on a 16 inch wheel and a 4 1/2 inch backspace on a 15 inch wheel. Tech Tip: If you are looking for 12 inch discs off of a donor car, do not use police or taxicab spindles. The lower ball joint tapers are too big and will not work. The ball joints for those vehicles can not be machined down to fit your control arm either. The following lists of donor cars are used for GM tall spindle conversions. This conversion, in conjunction with our tubular upper control arms, changes the geometry curve and creates a negative camber curve. We highly recommend the system if you are looking for superior handling. They are not used for drag racing applications. Donor cars with tall spindles and 11 inch disc brake rotors: Buick full size 77-81, Century 73-77, Riviera 77-78, Skylark 75-79, Cadillac Seville 76, Chevy full size 77-81, Camaro 70-81, Chevelle 73-77, Monte Carlo, Nova 75-79, GMC Sprint 73-77, Pontiac full size 77-81, Firebird 70-81, Grand Prix 73-77, Lemans 73-77, Phoenix 77-79, Ventura 75-77, Oldsmobile Cutlass 73-77, Omega 75-79 Donor cars with tall spindles and 12 inch disc brake rotors: Buick full size: LeSabre wagon/Electra wagon 77-94,Cadillac Fleetwood/Deville 77-84, Brougham/Fleetwood 85-94, Chevy full size: Bel Air/Biscayne/Caprice/Impala 77-96, Olds 98/Delta88/Delta 88 wagon 77-92, Pontiac full size: Bonneville/Catalina/Grandville 77-86 Important: There are two different types of 12 inch disc brakes spindles. One version uses a small outer bearing measuring .750. The second type uses a larger outer bearing measuring .850. Use the larger diameter outer bearing spindle because the rotor you are going to need is off a 1988-92 1LE Camaro/Firebird GM part #18016035. These rotors have the correct bolt pattern 5 on 4 3/4 bolt circle; however, the rotors use 12mm studs rather than 7/16 studs. You need to change the studs over to 7/16. We use a DBS-42 kit for this conversion. Global West manufactures front upper control arms (with Negative Roll Technology) for the Chevelle, El Camino, Malibu, and Monte Carlo--model years 1964, 1965, 1966, 1967, 1968, 1969, 1970, 1971, and 1972. What is a Negative Roll suspension system? Note: Negative camber refers to the suspension tilting the tire in towards the engine as the tire moves up into the fender. Positive camber would be the opposite. The tire would be tilting out of the fender as the it moves up into the fender. Almost all production cars have positive camber gain. Why would I want Negative Roll? If you are serious about bringing your car up to today’s standards, a negative roll system will be your first step. Negative Roll geometry keeps a greater portion of the tire on the pavement through the turn, increasing the car's cornering ability. Vehicle response and handling is dramatically improved especially during corner entry. What is required to convert to a Negative Roll system? In order for A-bodies to convert over to a Negative Roll system, four components are required. Tall GM spindles, special tubular upper control arms, machined lower ball joints, and different outer tie rods are required. Why? Because the donor cars spindle tapers are different. G-bodies only require tall GM spindles and special tubular upper control arms. Spindle tapers for this conversion are the same as the standard shorter spindle. See additional part requirements: If stock lower arms are used you will need machined lower ball joints part #2005 for installation. However, if you use lower control arm CNR-42L for standard springs or CNR-42H for coil-over applications, the correct ball joint for the spindle is used. 2. Outer tie rods part #3007 (1964-70 A-body) / Part #3008 (1971-72 A-body) sold in pairs. Did you know? Tubular lower control arms are available with the correct ball joints installed part #CNR-42L for standard spring and CNR-42H for coil-overs. Does my ride height change? Yes! Front ride height will drop 1 inch because of the taller spindle and lower ball joint combination. Why can’t I use my stock upper arm? The upper control arm is too long and alignment will be a problem. Why should I use your arms versus others? Global West control arms have better geometry curve, built in bump stops, load carrier ball joints, and special billet offset shafts. Del-A-Lum bushings are standard and we include a product warranty. Tech Tip: The maximum wheel backspace that can be used with our Negative Roll system on a 64-72 A-body is 5 7/8 high back space on 17 inch wheel, 5 inch back space on a 16 inch wheel and a 4 1/2 inch backspace on a 15 inch wheel. Tech Tip: If you are looking for 12 inch discs off of a donor car, do not use police or taxicab spindles. The lower ball joint tapers are too big and will not work. The ball joints for those vehicles can not be machined down to fit your control arm either. The following lists of donor cars are used for GM tall spindle conversions. This conversion, in conjunction with our tubular upper control arms, changes the geometry curve and creates a negative camber curve. We highly recommend the system if you are looking for superior handling. They are not used for drag racing applications. Important: There are two different types of 12 inch disc brakes spindles. One version uses a small outer bearing measuring .750. The second type uses a larger outer bearing measuring .850. Use the larger diameter outer bearing spindle because the rotor you are going to need is off a 1988-92 1LE Camaro/Firebird GM part #18016035. These rotors have the correct bolt pattern 5 on 4 3/4 bolt circle; however, the rotors use 12mm studs rather than 7/16 studs. You need to change the studs over to 7/16. We use a DBS-42 kit for this conversion.